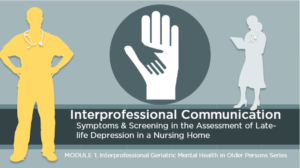 In this module we learn about identifying symptoms of depression, screening, and developing differential diagnoses for depression in older adults. CLICK HERE to begin. 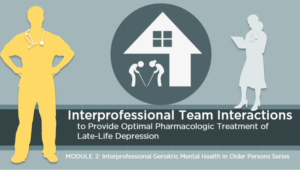 In this module we learn about identifying, evaluating, and planning an antidepressant regimen for older adults. CLICK HERE to begin. In this module we learn about identifying disparities, evaluating social determinants, and establishing a culture to improve mental health in older persons. CLICK HERE to begin.